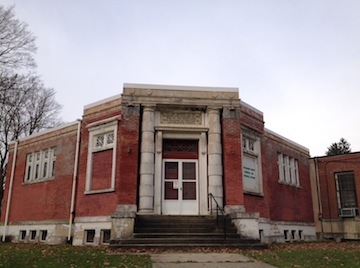 A recent decision by legislators in Cattaraugus Country, New York, has paved the way for the destruction of the county’s Civil War Memorial and Historical Building. Men from Cattaraugus County served in a number of regiments during the war, but arguably the best known was the 154th New York Infantry, better known as the Hardtack Regiment. Amos Humiston, the initially unidentified soldier at Gettysburg found with a photo of his three children, was from Cattaraugus County. The 188th New York came from the area, too; William Whitlock recounted their adventures through his letters in Allegany to Appomattox, edited by Valgene Dunham. St. Bonaventure University, where I teach, is located in Cattaraugus County. So that’s my dog in the hunt. This is local, which makes it personal. 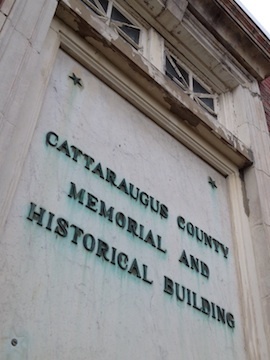 That seems to be the attitude of the Cattaraugus County Legislature, which has announced plans to demolish the Civil War Memorial and Historical Building that stands across from the county center in Little Valley—all in the name of convenient parking. Ironically, “convenient parking” is not one of the motives most frequently cited by men 150 years ago when they chose to enlist as soldiers and sailors. They enlisted to preserve the Union, to abolish slavery, to fulfill their personal sense of honor and duty. The historical building once had a gorgeous glass dome. 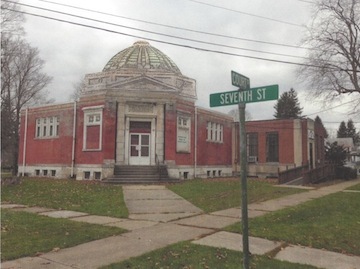 Historian Mark Dunkelman, also a noted artist, created a rendering of what the building might look like if it still had its dome. Because they enlisted, these soldiers and sailors endured years of privation, heartbreaking separation from their families, hard marching, and terrifying battle. They lost close friends. They gave up, quite literally, life and limb. Badgero died of disease in June 1863, says the 154th’s regimental historian, Mark Dunkelman, who offered me a glimpse into the lives of these men. Aldrich was captured in northwest Georgia at the battle of Dug Gap, then endured a grueling imprisonment at Andersonville and elsewhere. Brown was discharged because of illness and a deformed foot. Barzilla Merrill and his son, Alva, were both killed at the battle of Chancellorsville. Imagine how Mrs. Merrill felt when she got that news. They entrusted that memory and the memory of their sacrifices to future generations. Now, the rest of the nation celebrates the 150th anniversary of the Civil War and remembers the sacrifice of hundreds of thousands of men just like our Cattaraugus County natives (not to mention the sacrifices of their families back home). Meanwhile, the Cattaraugus County Legislature has decided to recognize the memory of those men and the sacrifices they made by literally paving it over. Legislators, what more did those men need to do to earn your respect? My thanks to historian Mark Dunkelman, the regimental historian of the 154th NY, who helped me with the research on this piece. Mark has been working tirelessly to save this memorial. If you’d like to help, contact him at nyvi154th@aol.com. 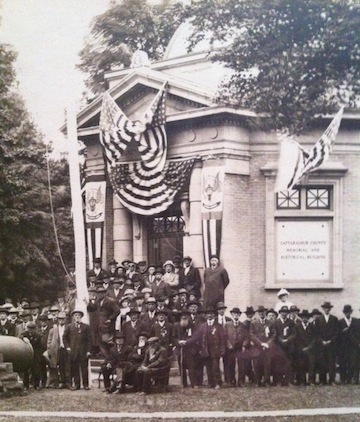 This entry was posted in Memory, Monuments, Sesquicentennial, Ties to the War and tagged "Hardtack" Regiment, Cattaraugus County, Mark Dunkelman. Bookmark the permalink. If the men who fought that war are to be forgotten by the politicians…nothing is beneath them. Disgraceful! The veterans of 1861-1865 gave their all and now the inheritors of this legacy want even more. Cattaraugus County legislators should be ashamed.